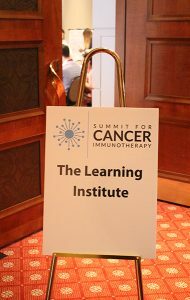 The BioCanRx-Cancer Stakeholder Alliance Learning Institute debuted at this year’s Summit for Cancer Immunotherapy. The pilot model was developed and organized by members of the Cancer Stakeholder Alliance Working Group and our HQP community. 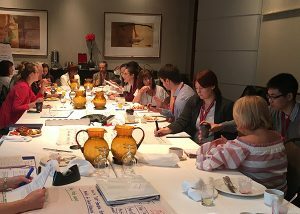 It brought together patient/public leaders and academic scholars in an interactive and collaborative knowledge exchange program. We asked two of the participants, a Cancer Stakeholder Alliance member and Highly Qualified Personnel, to tell us about their experience. In his riveting book “Thank you for Being Late,” Thomas L. Friedman posits that the way to stay optimistic in the age of acceleration includes engaging in life long learning. He says that jobs in the future will be primarily “stempathy jobs” – jobs that require and reward ability to leverage technical and interpersonal skills. He also refers to a poll of more than one million U.S. workers, students, educators and employers that found successful students had one or more teachers who were mentors and took a real interest in their aspirations and had an internship related to what they were learning in school. With that in mind, I harkened back to an idea from my time as part of the activities of the HIV community: to engage researchers with patient representatives. The goals were two-pronged: to support researchers in their research and to support patients in receiving research information in plain language to help them make the best personal treatment choices. These mutual goals also supported the systemic activities of obtaining reimbursement for these treatments to ensure widespread access to safe and effective treatments. This was called the CATIE Learning Institute. I took the idea to the BioCanRx Summit4CI organizers who agreed enthusiastically to develop a like-minded pilot project this year under a Steering Committee ably and patiently chaired by Patrick Sullivan, President, Team Finn and a Founder & Chairman of Ac2orn and supported by BioCanRx staff, in particular Renée Leduc. I had never been part of creating such a project and was totally amazed at the amount of work it took – matching patients and young researchers, developing workbooks with questions for them to consider as they navigated the conference together, selecting topics for them to report back to the group and developing our final report. Each morning we met for an hour prior to the conference to report previous day’s findings and to critique the research presentations. We invariably ran out of time. Everyone was so animated and engaged even at 7 a.m.! From left to right: Rebecca Foley, Louise Binder and Tim Guo. Patient representatives learned technical information about design challenges and other barriers faced by researchers doing preclinical and clinical work in Canada. I became acutely aware of the difficulties of finding adequate funding to do statistically significant and reproducible research in these novel areas of oncology research. How exciting but how courageous to work in an area fraught with the possibility of disappointment at every turn. Not for those seeking instant gratification by any means – as I often say friends, much wiser to take up dog walking if that is a need you have. In fact, it reminds me a lot of being a patient representative trying to convince governments and private industry including insurance companies to develop health policies and systemic treatment reimbursement programs that are both fiscally sound and flexible enough to take into account not only population health issues but also individual patient needs. Learning from, and about, these young researchers gave me a sense of rejuvenation for the work of getting their successful ideas into research and their successful research into people’s hands who desperately need these innovative, important new therapies. I feel that ultimately we came to understand better each other’s complementary and synergistic roles. I also learned more about these innovations and can speak more knowledgeably about the cancer research agenda we so badly need. I feel we moved from being solo pilots, if you will excuse the pun, to becoming a crack flying squad of researchers and patient representatives. Now let’s learn some new flying formations together. For many research students like myself, pursuing scientific studies is motivated by a desire to help others and improve care for future generations. 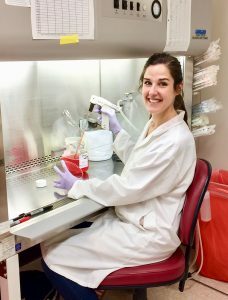 This drive to help others, combined with my curiosity about biological systems, is how I ended up in the lab of Dr. David Evans in my PhD studying oncolytic viruses. Currently in my third year, every day I go into lab and conduct research on how to utilize viruses to treat cancer. However, amidst the systematic process of research, such as the data entry, experiments, and statistical analysis, it is easy to become so immersed in science, that you lose track of your initial motivations to impact patient care. This past June, through my participation in the Learning Institute (LI) at the Summit4CI, I was once again reminded how rewarding it can be to remember that patients are an important part of the research equation. Connecting the patient and research community through knowledge exchange can be mutually beneficial to both the scientist and the patient community. Our LI group consisted of HQP trainees, like myself, who were tasked with translating the science presented at the conference, and patient advocates from cancer communities across Canada. Our objective was to meet and discuss the research from the conference, and compile a report which could be circulated among patient communities to keep them informed about immunotherapy research in Canada. Although we did, of course, discuss the science, we took time to get to know each other and discuss our motivations for how we ended up in research or became involved with patient communities. We examined scientific presentations from the previous days, discussed what the key points were, and how it could be applicable to patients. As a trainee, these meetings helped me improve many of my soft skills, such as scientific communication, effective story-telling in science, and even improve my networking skills with those outside of research. However, perhaps even more significant was the impact that my participation in the LI had on my outlook and perspective on translational science. The patient advocates at the LI were continually thinking about research from the perspective of the patient, asking things like “what would be pertinent for my patient community to know about this research?”. Consequently, I too began listening to presentations from this perspective. I was now aware of the patient community my patient advocacy “buddy” was representing and I started thinking about research from this perspective in addition to my deeply engrained research perspective. I found myself asking: “how could this research impact patients? What would this mean in terms of treatment, survival, or quality of life?”. I was continually thinking about how the science presented could be applied in a clinical setting. This perspective has stuck with me since, and I have even found myself observing my own research project differently, asking these same questions. This experience helped me re-orientate my perspectives on research. Having participated in the LI, I felt more connected to the patients I originally hoped my research would help. By discussing research with patient advocates, the patient perspective was brought back into the research equation. My involvement in the LI had a far more significant impact on me than simply meeting with others and translating research into lay-terms. My participation in the Learning Institute changed how I listen to scientific presentations, altered how I conduct and evaluate my own research, and perhaps even altered the direction of my career path. Although not everyone’s experience may have been as impactful as my own, my hope for the LI is that more members of the research community realize the value of interacting with patient communities and engaging in programs outside of research. The program was rewarding in so many ways, both personally and professionally, and I hope that others will participate in future LI initiatives. On a larger scale, maintaining relationships between scientists and patients can only serve to strengthen the health care landscape in Canada, and hopefully, lead to better treatments in the future. 2017 BioCanRx-CSA Learning Institute Participants. Back row, from left to right: Israel Matos, Madison Turk, Samantha Burugu, Kathy Matuszewska, Allison McNamara, *Kathy Brodeur-Robb, John-Peter Bradford, Chad Irwin, Tammy Northam, Tim Guo, and John Bell. Front row, from left to right: Rebecca Foley, Rachelle Davis, Xining (Linda) Yang, Ksenia Bezverbnaya, Helene Hutchings, *Nicole Forbes, *Louise Binder, Aditi Sood, Gabrielle M. Siegers, *Brittany Umer, and *Renée Leduc. Missing from photo: *Linda Eagen and *Patrick Sullivan. Learning Institute Developers and Organizers are indicated by “*”.